In October, LinxCasino.com will present the biggest online slots tournament ever: It is played on the Lara Croft Tomb Raider* slot. It is called The Grand Slam of Slots. It is guaranteed to award someone a first prize of €1,000,000. Until then, the popular Microgaming-powered casino has lots of ways to win seats in the biggest slots tournament of all time. One such method is Feeless Friday - free tournaments where every Friday in July, the winner will take home their share of the $500 guaranteed pool and also receive entry to the Grand Slam of Slots. The Grand Slam of Slots Tournament will be played on one of LinxCasino.com’s most popular online slot machines, the Lara Croft Tomb Raider*. It’s a 5-reel, 15 pay line slot machine with a bonus-round, a wild symbol, a scatter symbol and a free-spin feature. 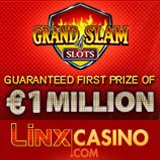 The €1,000,000 grand prize is the biggest online slots tournament prize ever awarded. More than 400 tournament participants will win prizes from the €1,407,300 on offer. “The Grand Slam of Slots is unique because players have to be invited to the tournament: they cannot buy-in directly,” said Ben C of LinxCasino.com. “We have fantastic promotions leading up to the final tournament, such as Race to a Million where players can win their share of 1000 credits per week, entry to the Grand Slam of Slots and free spins on Tomb Raider*”. Wannabe millionaires can also win their way to the fall event by playing in $250 Guaranteed Tournaments held every Tuesday. Every deposit at Linx Casino also earns a chance in a free draw for one of ten more tournament seats. Grand Slam of Slot Tournament information, including all the details how to win seats, is available at: http://www.grandslamofslots.net/. Information on the Feeless Friday qualifier tournaments can be found at http://www.linxcasino.com/en/promotions/feeless-friday.aspx. LinxCasino.com offers more than 400 state-of-the-art casino games and huge progressive jackpots from Microgaming. It also provides benefits – like its easy-to-redeem Stars Points reward points – that aren’t offered anywhere else.